Mille crêpe literally means thousand crêpes in French. It is actually a French cake made of many layers of alternating delicate crêpes and cream or custard. Although there are also some patisseries claiming this dessert as Hokkaido Thousand Layer Cake, they are essentially the same. I came across this type of crêpe cake for the first time a few years ago. Back then, Japan & Taiwan's popular luxury cake could only be found in a few select restaurants in Jakarta, supplied by First Love Patisserie. As far as I know, today mille crêpe can be bought at Pancious and First Love Patisserie's (recently-opened independent outlet) in Plaza Indonesia. Hurrah! So what's the difference between the two? Pancious only offers limited flavour, the one I tried was Orange Suzette. 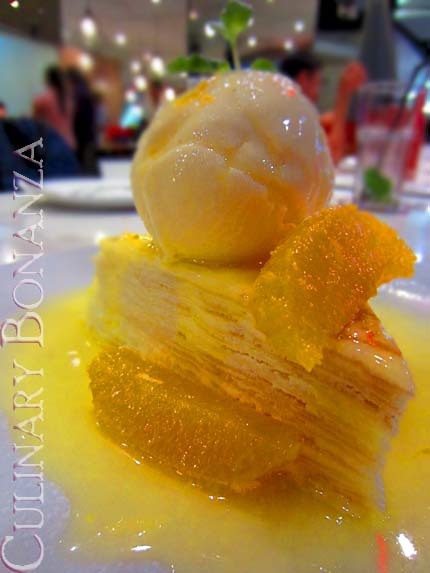 The alternating stack of 20 thin and delicate crepes and soft whipped cream was topped with orange slices and your choice of ice cream. Whereas First Love Patisserie has more flavours such as blueberry, strawberry, cheese, cookies & cream, tiramisu, green tea, chocolate, etc. If you click on its page, all the photos look so very tempting! 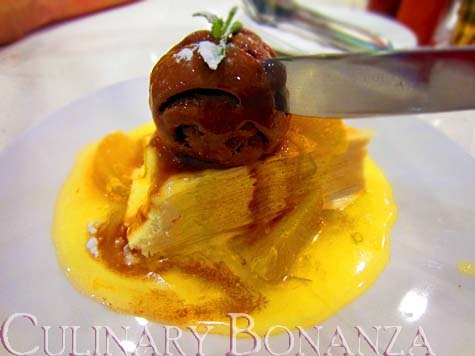 Pancious' Orange Suzette comes with orange slices, orange syrup and topped with a scoop of ice cream of your choice. The price is IDR 38,500 / portion. Meanwhile, I bought First Love's mille crêpe in 2010 at Dante Coffee inside Mall Kelapa Gading 3 for IDR 26,000 (price might have changed since then). *) Photo from First Love Patisserie is not available yet. Will update soon. @Inez: I had this at Sushi Tei Central Park as well, but I wasn't sure if it was made by the Sushi Tei or maybe supplied by some other bakeries. yeah...i love this cake!! i had tried First love patisserie, its just Awesome! !